3136 Mangifera indica - Mallika Mango, Grafted ? 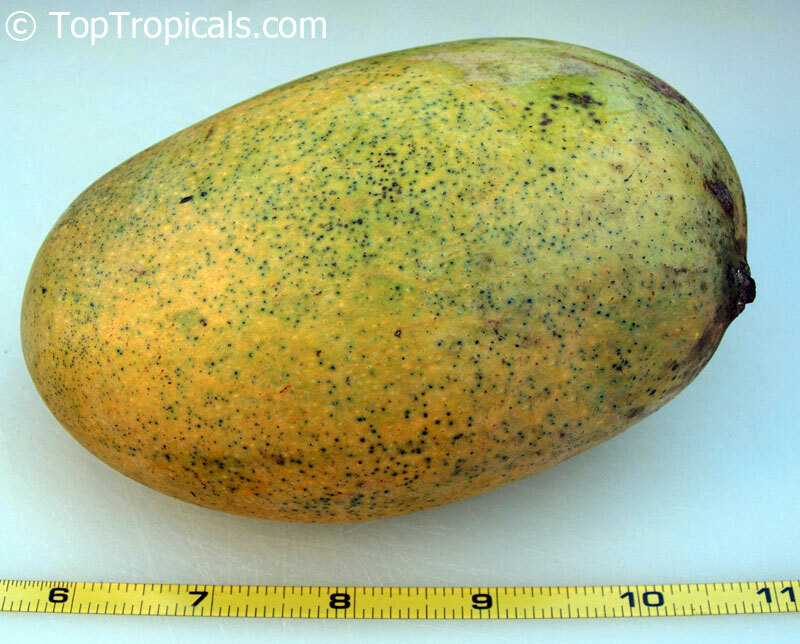 'Mallika' is a condo mango native to India. It is considered among the best of the new generation of Indian dessert mangos. The bright yellow fruit are a flattened oblong shape, with a rounded base and an irregular, non-waxy skin, and weigh from 10 to 18 oz. When properly ripened, the pasty, but completely fiber-free flesh is a deep orange, with an intensely sweet, rich and highly aromatic flavor with hints of citrus and melon. Fruit are harvested mature-green, before they break color on the tree and should be stored at a temperature of not less than 70F for 2 to 3 weeks for proper ripening. In this manner their ultimate eating quality will be achieved. The fruit can be refrigerated after complete ripening, but not before. Although best consumed out-of-hand, 'Mallika' also excels in juices and as dehydrated slices, with a distinctive honey flavor. The fruiting season is from late June to July. The tree is semi-dwarf and moderately vigorous, making it attractive to mango growers outside of India, who are always looking for new niche markets around the world. It has become a favorite due to its superb flavor, unparalleled disease resistance, and small but extremely productive habit. 4160 Mangifera indica - Mallika Mango, Large size, Grafted ? 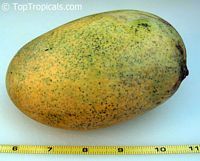 'Mallika' is a condo mango native to India. It is considered among the best of the new generation of Indian dessert mangos. The bright yellow fruit are a flattened oblong shape, with a rounded base and an irregular, non-waxy skin, and weigh from 10 to 18 oz. When properly ripened, the pasty, but completely fiber-free flesh is a deep orange, with an intensely sweet, rich and highly aromatic flavor with hints of citrus and melon. Fruit are harvested mature-green, before they break color on the tree and should be stored at a temperature of not less than 70F for 2 to 3 weeks for proper ripening. In this manner their ultimate eating quality will be achieved. The fruit can be refrigerated after complete ripening, but not before. Although best consumed out-of-hand, 'Mallika' also excels in juices and as dehydrated slices, with a distinctive honey flavor. The fruiting season is from late June to July. The tree is semi-dwarf and moderately vigorous, making it a great cultivar for pot culture. It has become a favorite due to its superb flavor, unparalleled disease resistance, and small but extremely productive habit.